The most-asked question of foremost fantasy fine artist James C. Christensen is "Where do you get your ideas?" He finally gives us an answer (of sorts) in his delightful new limited edition fine art print. Popular Christensen artistic touches are here in abundance, including the ornate costume and, of course, the trademark fish, symbolizing the fantastic made real. "Fishing is fun," he says. "At the 1987 BYU Art Show, I poked a little fun at myself and my colleagues, and the human tendency to return to the same fishing grounds again and again. The green apple, striped cloth, and rainbow are references to my colleagues. And, of course, there's my ubiquitous fish  which I sometimes find myself planning into a painting just because it's expected of me." 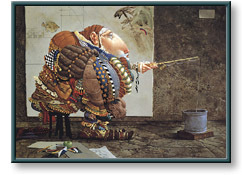 Fishing copyright © 1995 by James C. Christensen is prohibited from being copied. All applicable © laws apply and are reserved by artist James C. Christensen.